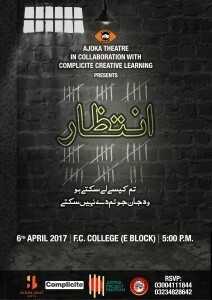 Justice Project Pakistan, Ajoka Theatre Pakistan, Complicite Creative Learning and Highlight Arts presents ‘Intezaar’ – an interactive theatre piece bringing you stories straight from Pakistan’s prisons in an honest, heartfelt account of real inmates on death row. For more information on our work with Justice Project Pakistan please click here. This event is not ticketed, but please RSVP by contacting us via the details on the poster. Your name can be registered with the college which is necessary for your entrance on campus.